This modern yellow gold update on the classic Marvel Necklace is a must have for any collection! 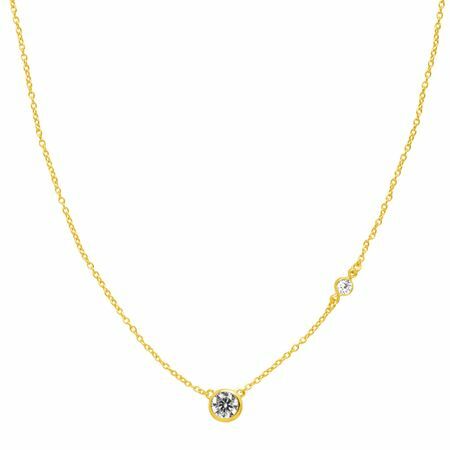 Two cubic zirconia stones dot the 18K yellow gold-plated sterling silver chain, making this piece a staple in any wardrobe. Feature piece measures 1/4 by 1/4 inches. Necklace measures 16 inches long, plus a 2-inch extender for adjustable length, and features a lobster clasp. Piece comes with a “.925” sterling silver quality stamp as a symbol of guaranteed product quality.